C1095. NIKOLAI MALKO Cond. Philharmonia Orch. 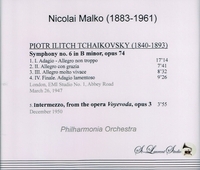 : 'Pathétique' Symphony #6 in b, recorded 1947; Voyevoda – Intermezzo - recorded 1950 (both Tschaikowsky). (Canada) St Laurent Studio YSL 78-112. Transfers by Yves St Laurent.